Judge Bashier Vally has a lugubrious demeanour, like a cartoon character whose pessimism ensures a dark cloud constantly hanging over his head. 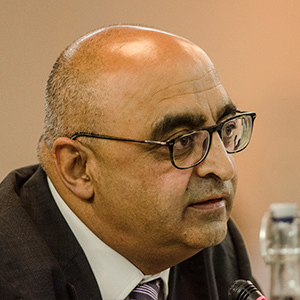 So when, during his October 2016 interview for the same position, the South Gauteng high court judge started moaning to the Judicial Service Commission about not getting enough acting time at the Competition Appeal Court, he was soon getting the boot-in-the-throat treatment sometimes meted out by the commission. He was eventually unsuccessful. Vally was appointed to the South Gauteng High Court in 2012. He grew up in the Johannesburg township of Lenasia and obtained a B Comm degree in industrial psychology from Wits University. Following university Vally became involved in the Commercial Catering and Allied Workers Union of South Africa as an “organiser, negotiator and educator”, which deepened his passion for labour law. This led to him completing an LLB from Wits in 1995. He joined the Johannesburg Bar a year later with his practise focused on labour law and constitutional law. Earlier in 2017 Vally formed part of a full South Gauteng High Court Bench which certified a silicosis class action, opening a breach for a large group of mineworkers to sue the gold mining industry for allegedly not protecting them, for decades, from the effects of silica dust, which causes silicosis and increases the risk of tuberculosis. The claims for mineworkers, estimated to number as high as 500 000, could run into billions of Rands. The judgment jointly written by Vally and South Gauteng Deputy Judge President Phineas Mojapelo, noted that; “the industry left in its trail tens of thousands, if not hundreds of thousands, of current and former underground mine workers who suffered from debilitating and incurable silicosis and pulmonary tuberculosis” while reaping huge profits. In 2015, at the height of the #FeesMustFall movement, Vally granted an interim interdict in favour of Wits University which was seeking to halt disruptions on its campus, with the caveat that this did not impede freedom of speech at the university. While several of the cases Vally has adjudicated have dealt with labour and union matters, as well as issues of protest and free speech, he has also sat on some that involve the tawdrier side of South African celebrity life. When racist and musician Steve Hofmeyer had proved tardy in signing his divorce agreement with Natasha Sutherland, and subsequently backed out of maintenance payments of R17 500 per month, Vally, then an acting judge at the South Gauteng High Court, ordered him to step up soonest. He found that Hofmeyer must accept “full responsibility” for the delays, sign up or face the court’s bailiff, and ordered costs against him. In 2017 Vally drew the ire of supporters of President Jacob Zuma when he ordered the country’s former Number One provide the record and reasons that influenced his decision to conduct a midnight reshuffle which led to the sacking of finance minister Pravin Gordhan. Vally ruled that Zuma’s powers were not unfettered and that he was legally required to exercise his power rationally. This led to disturbingly vitriolic attacks on Bashier by Zuma supporters including the ANC Youth League in eThekwini which branded him an opposition party collaborator and called on the JSC to “fire” him. “In a constitutional democracy there can never be a court order forcing an elected president to account on matters vested in his office‚ least of all to a party that was rejected by the majority of our people in the polls. Such a judgment is misconduct‚” he continued. If the emotionally charged exchanges between South Gauteng High Court Judge Bashier Vally and Competition Appeal Court (CAC) Judge President Dennis Davis are an indication of their apparently normal relationship — which is how the former described it — then the acrimonious divorce film, Kramer v Kramer, needs to be rethought of as a flick about happy, functional families. When it was Davis’ turn to question Vally the interview soon descended into an unedifying series of bickering, interruptions, allusions to some previous disagreements over cases they may have heard together, and shout downs. At one point Vally accused Davis of acting immaturely in the interview: “You sometimes distract me with your facial expressions,” he said when trying to answer a question. Davis asked Vally questions about the legal framework that governs the court, giving the impression of intending to show him up for a possible lack of knowledge. At times, Vally did appear to flail around for answers about relevant legislation and proposed amendments to the Competition Act, which is set to go before parliament. Noting that the “only time we have minority judgments” at the court was when Vally was adjudicating there, Davis then quizzed him on the necessity for collegiality at the court. Vally responded by saying that he had always argued his points and “put forward my arguments and judgments for the world to see” on points of law, and not to appear personally contrarian. “Collegiality cannot translate into concurrence,” he chided Davis. Vally then accused Davis of not being ready to accept a “diversity of ideas” while preferring “tin soldiers” all drumming to the same beat, the kind of hegemony which would “make everybody into a Nazi” at his court. Davis shot back that no-one would consider the various Supreme Court of Appeal and Constitutional Court judges who had worked at the CAC of being mindless Nazis. Vally then flipped the tables on Davis, asking him whether the questions about collegiality were asked so as to undermine his candidacy. “If that was done to jeopardise my position then there is a serious problem,” he thundered. When Vally described the proposed amendments to the Competition Act as recognising, and aiming to address, a “lacuna” in the manner in which oversight of corporate activity could be administered, Davis pressed him on this. Vally said the amendments recognised the racialised concentration of economic activity and wealth in South Africa and sought to address these. In spite of their fiery exchanges Vally told the commission that he hoped “we don’t suggest we have a turbulent relationship” because the “contrary” was apparently true. The debate continued unabated until other commissioners finally got a chance to ask Vally questions which dealt more closely with the technical aspects of this area of law, the influence that economic experts had in these courts, his approach to cases relating to predatory pricing and how SA competition legislation compared to other countries. Vally was recommended for appointment by the JSC which suggests that the Competition Appeal Court may become as interesting to watch as parliament was during former president Jacob Zuma’s corrupted tenure. So when the South Gauteng high court judge bemoaned his having been called to serve only one acting stint at the Competition Appeal Court his manner — and the repetition of his woe-begone experience — may have spurred on the members of the Judicial Service Commission to take him to task for using the interview forum to “air grievances”. Commissioner Mathole Motshekga wondered why he was approaching the interview as an “opportunity for lamenting” — a sense that appeared to shared by several of the commissioners. This despite Vally going to great lengths to state that he was “not complaining”. The appointment of acting judges has long been a murky process with the criteria used to make these appointments unclear and still informal. A point that Vally raised during his interview, pointing to the fact that “one never knows how these decisions are made” and stressing that, especially for specialist legal fields and courts, “if you don’t give people an opportunity, you don’t develop their skills”. Advocate Lindi Nkosi-Thomas asked Vally to suggest ways to enhance the process of appointing judges and he stated that “improv[ing] transparency” was essential. Vally, who was not appointed to any of the two vacancies at the court had the longest interview at 29 minutes.